Topics: Reservations, Discount Coupon, Fleet, Rates, and Affiliates. It has 2 DNS records, ns2.bluehost.com, and ns1.bluehost.com. 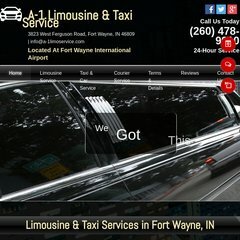 A-1limoservice.com's server IP number is 66.147.244.185. It is hosted by Bluehost Inc (Utah, Provo,) using Apache web server.